The five regions are presented in descending order of Christian population, with the region with the highest number of Christians (the Americas) appearing first and the region with the lowest number of Christians (the Middle East-North Africa) appearing last. 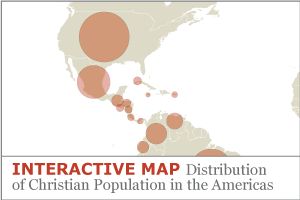 Christians living in the Americas make up 37% of Christians worldwide.8 The three countries in the Americas with the largest Christian populations also have the three largest Christian populations in the world: the United States (247 million Christians), Brazil (176 million) and Mexico (108 million). The 10 countries in the Americas with the largest number of Christians collectively are home to a third (33%) of all the world’s Christians. More than 175 million Brazilians are Christian, making the country’s Christian population the largest outside the United States. 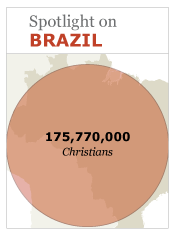 By way of comparison, Brazil has more than twice as many Christians as Nigeria and about three times as many as Germany. Indeed, nearly one-in-twelve Christians in the world (8%) are Brazilian, and an overwhelming majority of Brazilians (90%) identify themselves as Christian. Since the Portuguese conquest of Brazil in the 16th century, the country has been overwhelmingly Catholic. In 1950, almost 94% of Brazilians identified with Catholicism; as recently as 1980, Catholic affiliation approached 90%. Between 1980 and 2000, however, the Catholic share of Brazil’s population fell by 15 percentage points to 74%.1 Despite the decline, Brazil’s Catholic population of about 134 million remains by far the largest in the world. (Mexico’s Catholic population is a distant second at 96 million.) About one-in-eight Catholics worldwide (12%) are Brazilian. 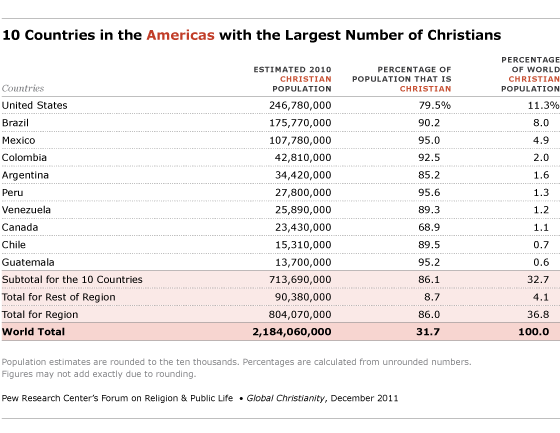 The United States is the world’s third most populous country, but it has by far the largest Christian population. With nearly a quarter of a billion Christians, the U.S. dwarfs even Brazil, which has the world’s second-largest Christian community (more than 175 million). About 80% of the U.S. population identifies as Christian, and U.S. Christians represent 11% of the world’s Christians.Since the birth of the nation in 1776, the vast majority of religious Americans have been Christian. The settlers who colonized the Eastern seaboard between New France in the north and Florida in the south came largely from majority-Protestant Northern Europe, especially England, Scotland, Wales, the Netherlands, Scandinavia and Northern Germany. Other factors, too, have diversified America’s religious landscape. Other Christian groups such as Mormons and Jehovah’s Witnesses, many of which were founded in the United States in the 19th century, have grown dramatically and together number nearly 11 million adherents, or about 3% of the U.S. population. 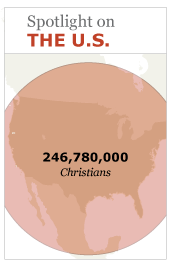 The U.S. is also home to nearly 2 million Orthodox Christians. Membership in long-established Protestant churches, such as Congregationalists, Presbyterians, Episcopalians and Methodists, has declined, while membership in newer evangelical and pentecostal churches has grown. Today, the U.S. has more evangelical Protestants than any other country in the world. 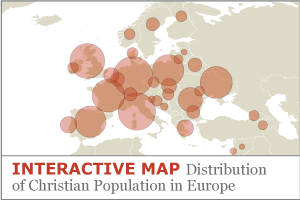 Roughly a quarter of the world’s Christians (26%) live in Europe.9 This makes Europe the region with the second-largest share of the world’s Christians, following the Americas. 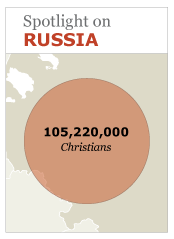 Russia has the largest absolute number of Christians in Europe (105 million). Despite the Communist government’s attempts to minimize religion in the country for much of the 20th century, more than 70% of Russians are Christian, primarily Orthodox Christian.10 Russia alone accounts for about 19% of Europe’s Christians and nearly 5% of the world’s Christians. 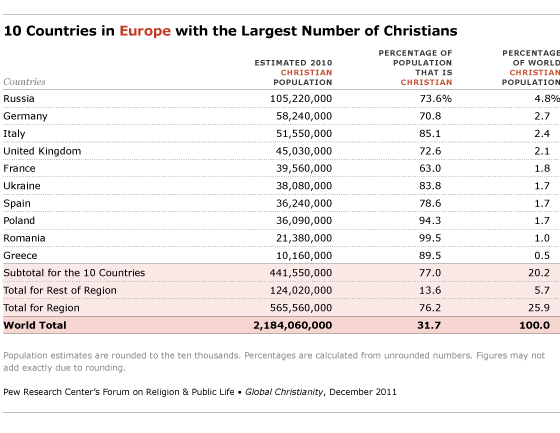 Russia and the other nine countries with the largest number of Christians in Europe (Germany, Italy, United Kingdom, France, Ukraine, Spain, Poland, Romania and Greece) collectively are home to one-in-five (20%) of the world’s Christians. 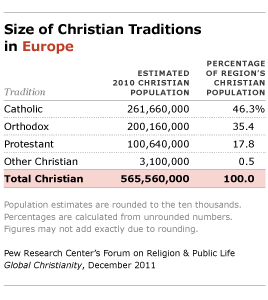 Catholics are the largest Christian group in Europe, accounting for more than four-in-ten European Christians (46%). 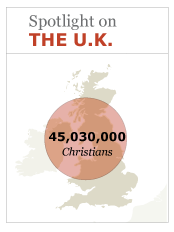 The second-largest Christian group in Europe is the Orthodox, who make up 35% of European Christians. The overwhelming majority of the world’s Orthodox Christians (76%) reside in Europe. Germany has about 58 million Christians, making it the country with the largest Christian population in Western Europe and second only to Russia in Europe as a whole. 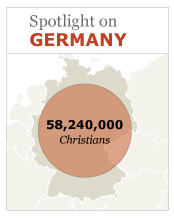 Germany’s Christian population is also the ninth-largest in the world. More than 70% of the country’s total population is Christian, divided almost evenly between Protestants and Roman Catholics. Germanic tribes such as the Goths, Lombards and Franks were gradually converted to Roman Catholicism between roughly the 5th and 8th centuries. The formation of the Holy Roman Empire, beginning in the 10th century, served to consolidate Catholic influence across central Europe. 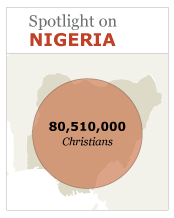 Because the proportion of Muslims and Christians in Nigeria is a sensitive political issue, the national census has not asked questions about religion since 1963.3 In 1953, 21.4% of Nigeria’s population was Christian, 45.3% was Muslim and 33.3% belonged to other religions, including African traditional religions. By 1963, the percentage of the population that belonged to other religions had declined by 15 points, nearly matching the 13.1-point increase for Christians. During this same period, the percentage of Muslims increased by less than 2 points.4 Christians have since increased in number and share to become about half of the population. 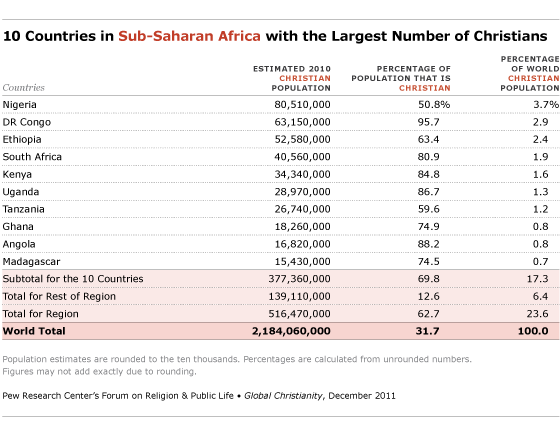 Ethiopia has the third-largest Christian population in sub-Saharan Africa, after Nigeria and the Democratic Republic of the Congo. Ethiopia has had a significant Christian presence since the establishment of the Ethiopian Orthodox Church in the early 4th century. 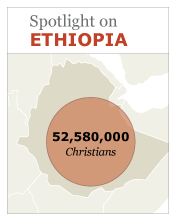 Since that time, the Orthodox Church has remained Ethiopia’s most influential religious body, with strong links between church, state and national identity.1 Today, the country’s Christians represent about 63% of the population. Muslims constitute the largest non- Christian group, accounting for about a third of the population.2 Ethiopia’s Christian community dates back to the early 4th century, when the emperor of the Ethiopian Axumite Kingdom converted to Christianity. After the emperor’s conversion, the patriarch of Alexandria in Egypt appointed a bishop to oversee a new church in Ethiopia. The Ethiopian Orthodox Church remained under the oversight of Egyptian Orthodox bishops of the Coptic Church until 1959, when it came under an Ethiopian patriarch. Like the Coptic Church and other Oriental Orthodox churches, the Ethiopian Orthodox Church teaches that Christ has one indivisible nature rather than two separate natures, divine and human (see Defining Christian Traditions on page 38). One of the world’s oldest churches, the Ethiopian Orthodox Church has its own liturgical language and calendar.3 The vast majority of Ethiopia’s Christians have adhered to the Ethiopian Orthodox Church for most of the past 1,700 years.4 Significant diversity has begun to characterize Ethiopia’s Christian population only in the last 25 years.5 Protestants and Catholics combined accounted for less than 5% of the population as recently as 1980.6 Today, however, the groups classified in this report as Protestant — including Anglicans and members of African Independent Churches — represent nearly 20% of all Ethiopians and 30% of the country’s Christians. 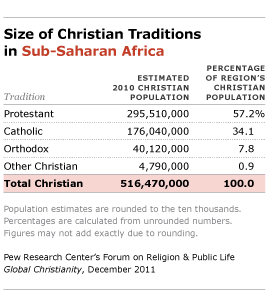 Roman Catholics make up less than 1% of Ethiopia’s total population. 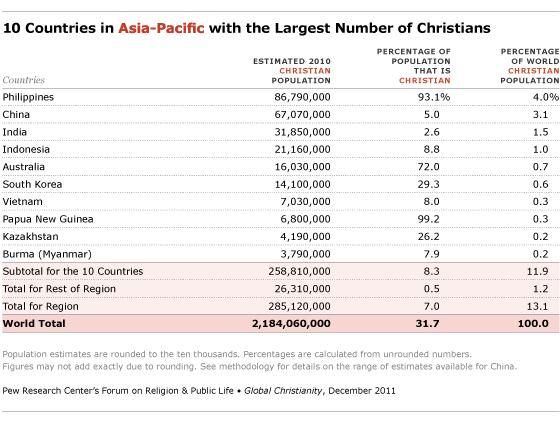 The Asia-Pacific region includes 13% of the world’s Christians.13 The region’s largest Christian population in absolute numbers is in the Philippines, a country that is overwhelmingly Christian (93%). Christians make up a minority of the population in China (5%), India (3%) and Indonesia (9%), but because these countries have very large populations, their Christian minorities are large in number. Collectively, the 10 countries with the largest Christian populations in the region are home to 12% of all Christians worldwide. 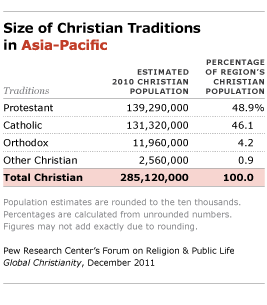 Slightly less than half of Christians in the Asia-Pacific region (49%) are Protestant, as broadly defined in this report (see Defining Christian Traditions). 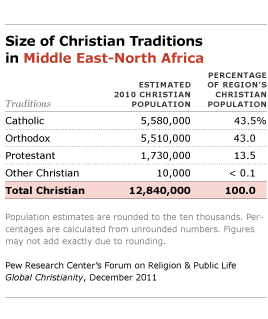 Most of the remaining Christians in the region are Catholic (46%), while 4% are Orthodox. 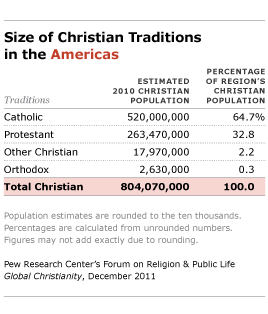 About 1% belong to other Christian traditions. As recently as three decades ago, few researchers even within mainland China knew whether religion had survived the Cultural Revolution (1966-1976) initiated by Chairman Mao Zedong. It is clear now, however, that religion not only survived but that hundreds of millions of Chinese today have some religious faith, including tens of millions of Christians. Visible in nearly every major Chinese city are the steeples of churches affiliated with one of the two state-approved and state-regulated Christian associations: the Protestant Three-Self Patriotic Movement and the Patriotic Catholic Association. Both associations operate their own seminaries, employ thousands of clergy and are served by the Amity Printing Company in Nanjing, which prints more than 10 million Bibles annually. A precise figure for the number of Christians in China is difficult to nail down because, aside from the fact that China does not ask about religion on its census, there is no fully representative survey of China’s 1.3 billion people. A further complication is that a substantial number of Christians worship in independent, unregistered churches. These churches do not have legal status because they have not affiliated with one of the two officially approved associations. Unregistered independent Protestant churches, often referred to as “house churches,” meet in various venues including homes, rented facilities, businesses and even public places. Additionally, a substantial number of Catholics worship in unregistered congregations that refuse to join the Patriotic Catholic Association. A main point of contention is that the Association operates independently from Rome; for instance, it appoints bishops without the approval of the pope. groups can be met with suspicion by all sides. 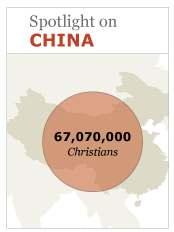 As noted above, this study’s review of numerous research sources suggests that Christians make up approximately 5% of China’s population, numbering about 67 million. Of these, roughly 9 million (0.7% of China’s total population) are Catholics, including 5.7 million who are affiliated with the state-approved Patriotic Catholic Association and a conservatively estimated 3.3 million who are affiliated solely with unregistered Catholic congregations. The exact number of Catholics in unregistered congregations is difficult to estimate because there may be double counting in some Catholic dioceses where churches and bishops are affiliated with both the official and unofficial churches. For instance, Beijing Archbishop Joseph Li Shan is recognized by both the Chinese Patriotic Catholic Association and the Vatican. 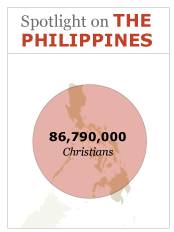 Christians affiliated with the state-approved Protestant Three-Self Patriotic Movement number roughly 23 million (1.7% of the total population). This study estimates that an additional 35 million Christians in China (2.6% of the population) are affiliated with unregistered churches or attend state-approved churches without having formal membership. Additionally, there are small populations of Orthodox Christians and other Christians, some of whom are expatriates. Roman Catholic priests and missionaries began arriving in the Philippines in the 16th and 17th centuries, around the time of the Spanish conquest of the country. The church steadily gained adherents over the centuries. By 1900, nearly three-quarters of the population professed Roman Catholicism.1 Spain’s control of the archipelago, which did not formally end until 1898 with the advent of American colonial rule, gave the church in the Philippines a Spanish cast, particularly in terms of leadership. The first Filipino bishop was consecrated in 1905, and the first Filipino cardinal in 1960.2 Today, Roman Catholics make up about 81% of the country’s population. 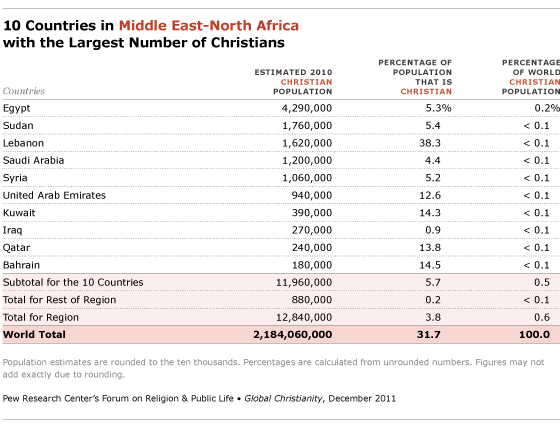 The Middle East-North Africa region is home to less than 1% of the world’s Christians.14 Only about 4% of the region’s residents are Christian. Although Christianity began in this region, it now has the lowest overall number of Christians and the smallest share of its population that is Christian. 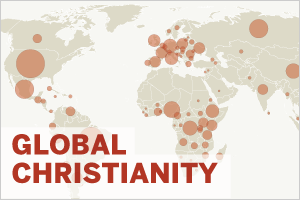 Christians are a minority in every country in the region. 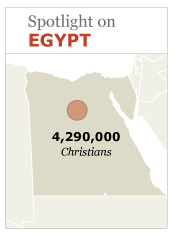 About half (47%) of all Christians in the region live in either Egypt or Sudan. 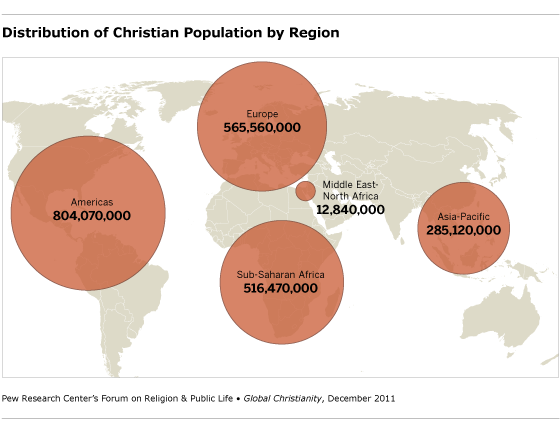 Lebanon has by far the highest percentage of Christians (38%) in the region. The only other countries in the region where more than 10% of the population is Christian are the Gulf states of Bahrain, Kuwait, Qatar and the United Arab Emirates. About 44% of Christians in the region are Catholic, including many Eastern-rite Catholics. Roughly the same proportion (43%) are Orthodox Christian. More than one-in-ten are Protestant (14%).